"You are everything I despise. The worst thing in all creation. I've defeated you time and time again, I've defeated you. I've sent you back into the void. I've saved the whole of reality from you. I am the Doctor and you are the Daleks." This story has all the ingredients needed to make a fantastic episode. It has deceptively smart Daleks, World War II setting, London, and Winston Churchill. Why do I feel so empty when I watch this? The sets for the bunker in London are amazing. There is some great atmosphere throughout the whole episode. The shot of The Doctor and Amy looking out onto London during World War II is chilling. It is really, really well done. It doesn’t take long at all for the Daleks to show up. We had the wonderful cliffhanger the week before with Churchill calling the Doctor with the imposing shadow of a Dalek on the wall. Now, once the Doctor is there, we see that the Daleks are fighting the plight of the war and are apparently a creation from some Professor Bracewell. The Doctor sees through this but can’t get anyone to believe him. In a nice nod to The Power of the Daleks, the green war coloured Dalek responds to the Doctor, “I AM YOUR SOLDIER!” It’s actually pretty neat. While the Doctor is trying to convince Churchill what is going on is wrong, there is a wonderful shot of the Doctor aware of a Dalek gliding behind him. These more unique shots are one major improvement on the production previous series. They are very welcome. The problem is the WWII charade does not last very long. The Doctor actually falls right into the Dalek’s hands (so to speak), and identifies them as Daleks. This starts a Progenator, which contains pure Dalek DNA, to percolating on a Dalek spaceship in orbit over the Earth. Now, the Progenator is new, to me, in which thousands existed but now only one had been found. The Daleks that we see in this episode is from a surviving ship from Journey’s End. They needed the Doctor to ID them as Daleks because they are not pure like the DNA in the Progenator and it wouldn’t work. This is where I get confused. 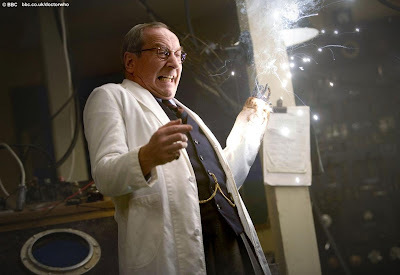 The DNA to create the Daleks in Journey’s End came from Davros himself. He is a Kaled but presumably, he would have done whatever he did before to create Dalek DNA from his own DNA. Why is this now pure Dalek DNA? Is it possible that the Daleks had re-engineered their DNA to be the primary DNA for the Dalek species? Thus making Davros’ way of creating Daleks out of date? I thought my friend had a more interesting theory. The Dalek ship that survived was from Parting of the Ways had Daleks engineered with human DNA. That would be a better reason why they were impure. I understand why the episode is titled Victory of the Daleks. The story itself is a vehicle to make the Daleks a monster that comes back as a race instead of a few individuals of a dying race that the writers have to create a reason for their return each and every time. I think it is a very smart idea. Although I absolutely adore the Dalek design of the RTD era of Dalek stories, I understand new people in charge have their own vision on how things should look. I think the message becomes a bit muddied and becomes a story only to introduce the new redesigned Daleks. Even worse is that I don’t think the redesign is very successful. What I think is the biggest problem with the redesign is that it looks out of proportion with everything else. Did you ever play with toys as a child? I did. Say, it was the early 80’s and I was playing with some Star Wars action figures and I needed a monster for them to fight, I would grab whatever looked right but it may not have been the right size but it’s all I had. I look at it a little like that. It also reminds me when the Sontarans returned in The Two Doctors. They were tall. Sontarans are not tall, they are short. That is how they were imagined by Robert Holmes. The new Daleks are too bulky and too big. They are almost bigger than people. They have a bizarre hunchback. I don’t understand the reason for such a dramatic redesign. There is a wonderful extra on the DVD of The Chase where Raymond Cusick, who designed the Daleks back in 1963, travels to Whales to meet the current designers of the series and look at the RTD era Daleks. Like I said, I love that design but Raymond didn’t look too impressed. I would be very interested to see his reaction to the new “Paradigm”. Talk about a major spoiler and it actually made a huge impact on my enjoyment of the story. Now, the more intelligent readers of this blog may have figured it out by that point but not yours truly. I hope they watch what they post in future. That was a major plot point ruined. I hope not many people saw it. What about Churchill? I am not sure I like the idea of the Doctor to be available to major historical figures at beck and call. Especially a person like Churchill who was rallying everyone and everything he could to stop, which seemed inevitable, invasion from the Nazis. In my opinion, the Doctor, who has knowledge about everything, should not be in a position to pick and chooses how he helps a figure like Churchill because he knows the future. It just doesn’t seem right to me. Maybe I am taking it too far but it almost cheapens what everyone fought for as Churchill had a friend who knew the future the whole time. Ian McNeice who plays Churchill turns him into a warm loveable old gentleman. Maybe he was a warm loveable gentleman. What was weird was his little, “I’m a cute old man” looks he would give to Amy Pond. Obviously, he was played as a caricature of Churchill but I think it would have been better to stay away from that angle (and character) all together. To me, it is clear that Mark Gatiss thought really hard about what he wanted to see in a really good Dalek story. It’s all cool stuff I wanted to see in a good Dalek story. 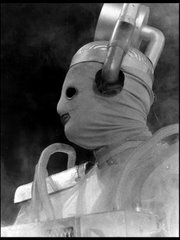 Unfortunately, I think the episode could have benefitted from an extra episode to really set up the trap for the Doctor. The story moves too quickly for me and I wanted to see more of WWII. Next Time: The Weeping Angels and River Song return as I take a look at Time of the Angels. I think it was a very weak story.